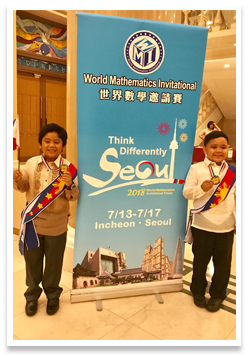 Two IMC Grade 4 students won Silver Medals in the recently held World Mathematics Invitational in Korea last July 13 to July 17. Djiren Riel Abdao and Joaquin Jobog (pictured below) each won Silver Medals alongside other Filipino students hailing from different schools. The Filipino contestants won 21 Gold medals, 41 Silver Medals, 35 Bronze Medals and 14 Merit Awards. World Mathematics Invitational is a renowned yearly competition held in various countries. Korea hosted the competition this year with Yonsei University as the venue. Congratulations again to Djiren and Joaquin! Good job and Keep it up!